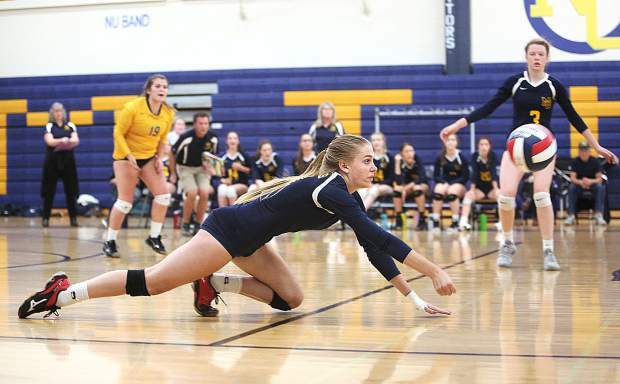 Nevada Union senior Bekah McGill makes a dive to save a hit from NorCal D-III playoff opponent Miramonte Thursday evening in Grass Valley. Despite the efforts of McGill and the rest of the team, the Lady Miners would fall to the Matadors in 5 sets. 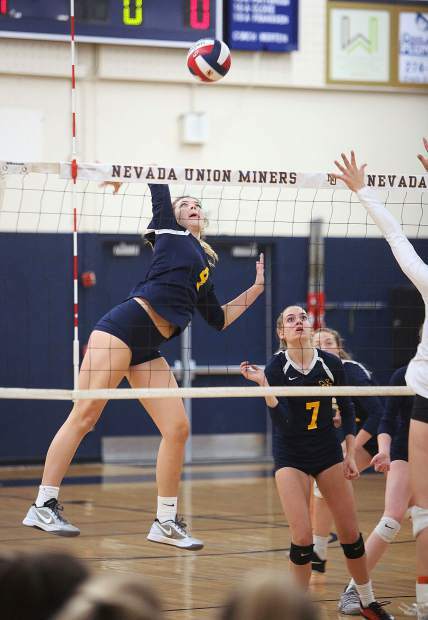 Nevada Union junior Faith Menary fires a spike past a pair of Miramonte defenders at the net during Thursday's NorCal D-III matchup. 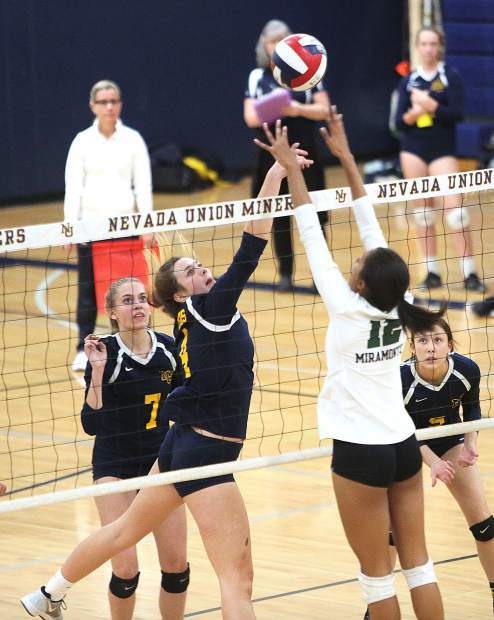 Nevada Union senior Meadow Aragon tips the ball over the net during Thursday's NorCal playoff loss to the Miramonte Matadors. 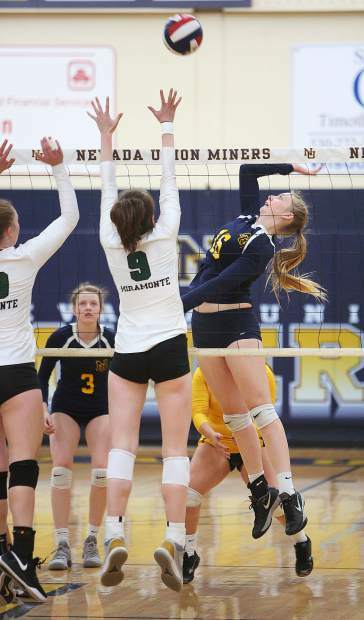 Nevada Union senior Meadow Aragon readies to fire a spike over the net towards the Matadors during Thursday's matchup. Emerson Dunbar sends a spike over the net during Thursday's matchup against the Miramonte Matadors. 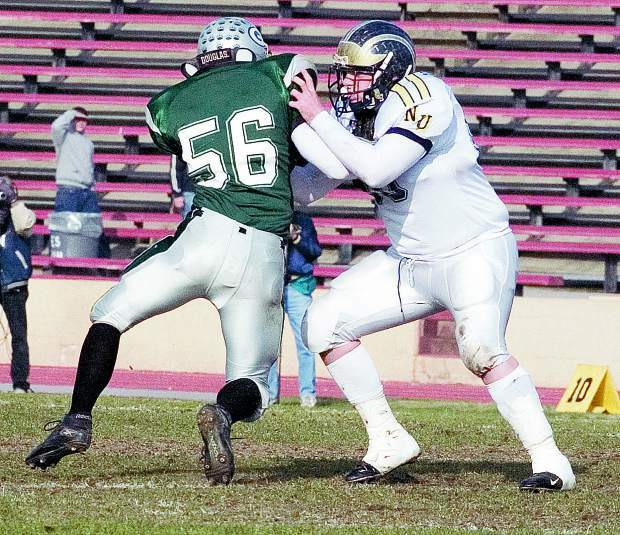 Aragon and Dunbar watch as a Miramonte spike sails past them. 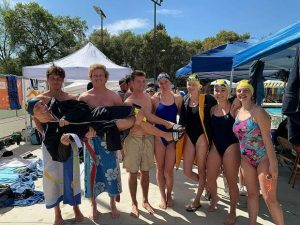 The Lady Miners had their season come a close Thursday night, falling in the second round of the CIF NorCal Division III Tournament. Competing on their home court at Albert Ali Gymnasium, No. 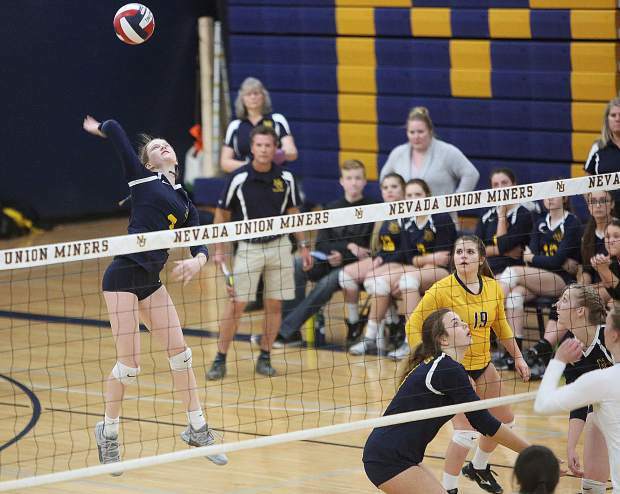 2 seed Nevada Union battled No. 10 seed Miramonte closely all night, but came up short in five sets, 21-25, 25-21, 25-21, 23-25, 17-15. After four thrilling sets yielded a 2-2 tie, the match went to a fifth and final set and, much like the first four sets, it was a battle until the end. 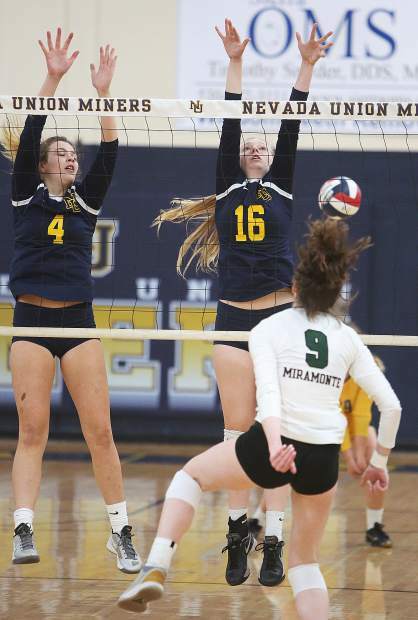 Nevada Union jumped out to a 5-2 lead behind kills from Faith Menary and Kendall Hughes, all of which developed from sets by Bekah McGill. Miramonte responded with a 5-1 run to grab a 7-6 edge. The two squads then traded points until it was tied, 10-10. That’s when NU reeled off three straight points, forcing a Miramonte timeout. The Matadors came out of the timeout on fire and scored four straight points to pull ahead 14-13. A Hughes kill brought it even again. 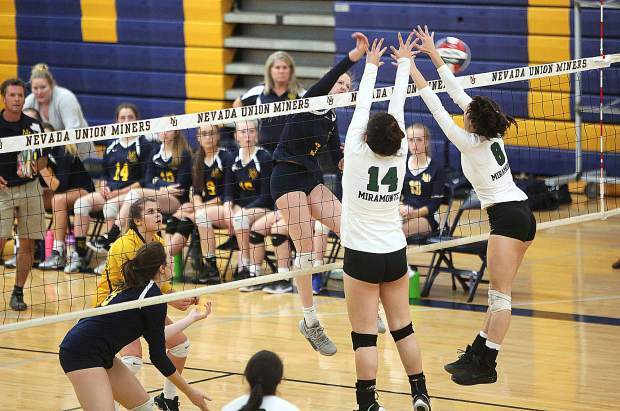 After trading the next two points, Miramonte put the match to rest with a pair of spikes the Lady Miners simply couldn’t handle. The loss concludes a season in which the Lady Miners went 33-19 overall, reached the Sac-Joaquin Section D-III semifinals and won their opening match of the NorCal tourney. 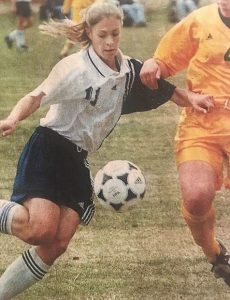 The Lady Miners will graduate a pair of talented seniors in McGill and Meadow Aragon, but will return a skilled group of juniors next season.